Dental implants are the artificial roots fixed to your gums to attach the new artificial tooth or crown. 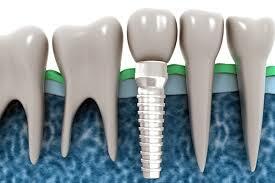 Dental implants surgery involves the use of two components such as Root and Crown. Root: They are below the gum line and enclosed inside the bone. Crown: They can be seen above the surface of the gum. These dental implants are often made of titanium since they have high biocompatibility and bonding ability with the jawbone. They are surgically placed into your jawbone, and then the crowns or the false tooth is attached to your implant. This new replacement tooth feels and looks like a natural tooth. It is the best alternative that can improve your dental health and increase the quality of your life. What to expect for Dental Implants Procedure? Preparation: Your dentist will examine your dental health, jawbones, and gum, and determine whether you are a good candidate for dental implants procedure or not. This will include x-rays for your teeth, jaw, and head. Phase 1: Using local anesthesia or sedation, your dentist will place the implants in your jawbone. Then the surgical site is allowed to heal for over three to six months. Phase 2: Once the complete healing takes place, the crown or abutment is placed as an extension of your implant that connects artificial tooth to the root. Most patients have the fear to undergo cheap dental implant treatment in Melbourne thinking that it is much painful. But, the dentist will offer both sedation dentistry and local anesthesia for the patients, depending on the pain tolerance capacity and how much they are worried about the procedure. Patients are advised to have only soft foods for nearly two weeks after the dental implants surgery for the fast recovery of your gum. What are the factors that affect the cost of dental implants in Melbourne? The necessity of dental procedure, such as sinus elevation, bone grafting, etc. These are the factors that may affect the cost of your dental implants procedure.